The Industry Pathways Course is a vocational training program empowering Year 9 and 10 students in the ACT to make informed choices about their future education and employment. This innovative pilot program aims to give ACT students exposure to a range of work environments. 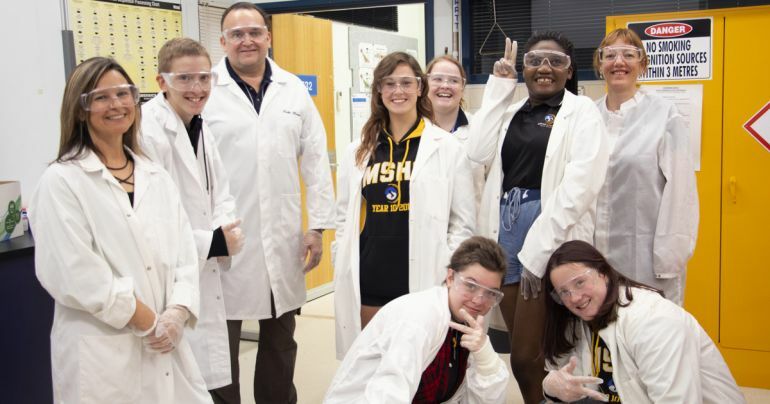 On the first Introduction to Industry day at CIT Bruce, the new program gave local high school students exposure to nursing, horticulture, forensics, renewables and construction. A total of 80 students from Namadgi School, Wanniassa School, Melba Copland Secondary School and Mount Stromlo High School are in the first cohort, with plans to provide a total of 320 new places in 2020. The course focuses on a unique student experience and is based on the 'jobs without genders' premise that there should be no limits or boundaries to a student's chosen career path. Throughout the program students are provided with three work placement opportunities selected from a range of occupations in high skills need areas for the Canberra Region - including STEM, trades, professional services and community services. The project is supported by funding from the National Partnership on the Skilling Australians Fund, a project-based agreement with the Australian Government, designed to meet the needs of industry and increase the number of apprentice and trainee commencements.